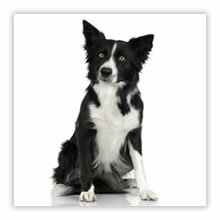 Is an 11 year old rescue Border Collie who had been left on her own for hours even days sometimes. Her new owners rescued her when she was nine. She barked when her new owners lighted candles, or switched on lights she was very nervous and barked when people walked past the house, she was nervous of walking over a certain part of the floor, charged ahead of people going up or down stairways, was very ‘clingy’ with her owners in the house and constantly followed the owners around the house. She would round up the kittens and eat from their litter trays. She is now much calmer and quieter, doesn’t chase up and down the stairs, bark at candles is much more playful and much less nervous of her surroundings. She is less agitated when people call at their home, it will take time but Lucy and her caring new owners are making good progress with her.